Forced to pamper an injured shoulder, Ross Luedtke didn’t particularly enjoy strapping on the Sully Shoulder Stabilizer all of last season. By the end of last season, Luedtke and his shoulder brace were working together in an unfathomably successful goal-scoring harmony. Luedtke, who recently committed to play at the Air Force Academy, registered hat tricks in three straight playoff games. His third goal in the Section 2A championship game gave the Spartans a 3-1 third-period lead over Breck. 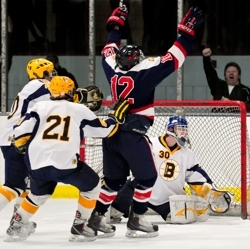 Orono eventually lost to the Mustangs in overtime. “I think we had our whole school there,” said Luedtke, who after the season underwent two surgeries to repair torn ligaments in his shoulder. “It was so much fun playing in that atmosphere. When I got that hat trick everyone was just going crazy. Luedtke had opened the playoffs with a hat trick in the Spartans’ 9-3 win over Providence Academy. Hat trick No. 2 came in the section semifinals in a 3-2 triumph over Blake. Luedtke, who scored 34 goals and added 36 assists in 28 games last season, will play at least one year of junior hockey before heading to the Air Force Academy. He will either play next season for the Coulee Region of the North American Hockey League or, depending on the interest level, in the United States Hockey League. Luedtke said his postseason scoring binge didn’t attract significantly more interest from college coaches. Air Force was the only Division I program that offered him a scholarship. The Hawks have six consecutive appearances in the Class 1A boys' hockey championship game, and six consecutive losses.